We would not be human if we did not occasionally wonder if cancer is something that we might get and the fate meant for us. We tend to think of it as being a matter of luck and something we have no control over. Yet we now know that 90 percent of all cancer is preventable so it makes good sense to try and stop it happening rather than trying to fix up a broken body once the wheels fall off. One of the main preventative measures is to keep our body composition (muscle/fat ratio) at a healthy level as one of the main drivers of cancer is how fat we are. Although it is easy to see when we are overweight there is another hidden type of fat that is not so obvious. In fact it can only be detected with body imaging such as an MRI scan. This fat lies deep inside the abdomen and even thin people of normal weight can have it. It surrounds the internal organs, changes hormonal levels and releases toxic chemicals that encourages disease particularly cancer. If your waist measurement is over 35 inches for a woman or 38 inches for a man you are very much at risk of this hidden problem. This highly metabolically active fat is particularly dangerous as it aggressively changes the chemical environment inside the engine room of the body around the most important organs that keep us alive. It is these changes that accelerate and promote the growth and division of cells making cancer easier to develop and take hold. If you live a no-proper exercise lifestyle your risk is high of having this nasty type of fat but the good news is proper exercise is the solution. 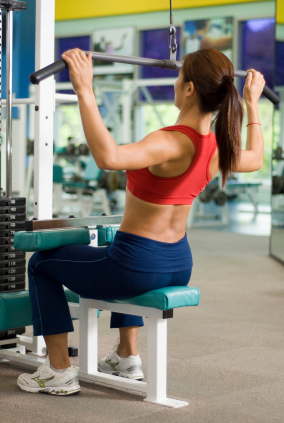 Strength training exercise is the quickest and most effective way to deal to this fat. It rebuilds and ‘wakes up’ weak flabby muscles that have allowed the body to accumulate this fat rather than burn it up in the muscle cells harmlessly for energy. Also of benefit is when the muscles are directly worked with adequate loading circulation is improved which helps the immune system circulate natural killer cells that locate and neutralize stray cancer cells trying to attack the body. Research is also uncovering how a process called apoptosis (programmed cell death) is triggered by vigorous activity such as strength training exercise causing cancer cells to die. You can see that we have a very good case to support the fact that regular proper exercise is vital not only to prevent cancer, but if you already have it, during your treatment and afterwards as well. To get even more ‘bang for your buck” ditch as many processed foods from your diet as possible and replace them with natural whole foods cooked from scratch. You need to put some effort into your exercise program so you need good nutrition to support your energy and strength levels. So, you can see, there is such a simple solution to reduce the need to worry yourself about contracting the most vicious killer disease of our modern world. But you will need to make it your number one health goal and priority, to become stronger, fitter and healthier and stay that way for the rest of your life. I go into more detail about proper strengthening exercise supported by nutrient-dense eating in my eBook “Just Say No To Cancer”. Just go back to the home page of this website to read more about it.